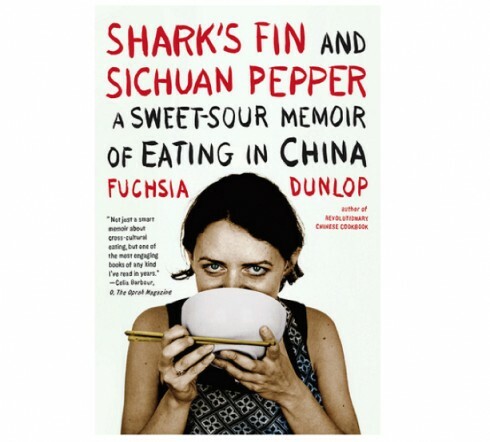 By far, one of my favorite books on this list is Fuchsia Dunlop’s ‘Shark’s Fin and Sichuan Pepper: A Sweet-Sour Memoir of Eating in China‘. Perhaps I’m biased because one of my oldest childhood friends lives in Shanghai, and I feel a kinship to those who write about China, and perhaps my bias extends from my love of Chinese food instilled from my father’s very good Chinese cooking skills (he learned from an Asian grandmother whom he exchanged grocery shopping for her for cooking lessons), but nevertheless there is something visceral that comes up every time I get to recommend this book to someone. When people come into Omnivore asking for their next good read, I usually direct them towards this book and start waxing poetic and verging on desperation. You MUST read this book. I’m not sure how I would even describe this woman without babbling about how cool she is and how much I admire her tenacity and how much I want to be like her. Here I am doing it again. Above all, I love reading books by smart, motivated, strong women. There, I said it. Some of my biggest role models are writers such as M.F.K. Fisher, Elizabeth David, and Judith Jones. These women inspire me every day. In brief, Fuchsia Dunlop is certainly one of these women I admire: a witty and persistent Englishwoman, who rather than taking the safe and comfortable route, decided to study abroad in China during her University years. People just didn’t do that in the 90’s. 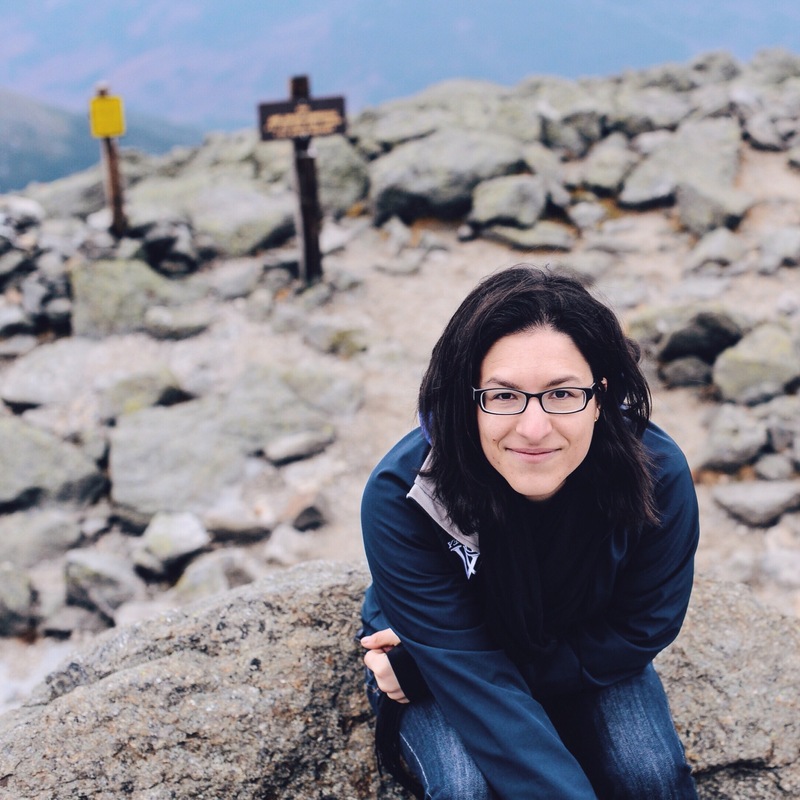 Her brief stint led to a lifelong passion – she went back to live there, and ultimately managed to stumble her way into becoming the first westerner ever to attend the Sichuan Institute of Higher Cuisine. Ultimately she went on to write two cookbooks, ‘Land of Plenty: A Treasury of Authentic Sichuan Cooking‘ and the ‘Revolutionary Chinese Cookbook: Recipes from Hunan Province‘ which are both excellent resources for Sichuan and Hunanese cooking. Beyond the cookbooks, it was a good thing she went ahead and wrote her memoir. Her voice on the page is clearly one of a woman I’d love to go gallivanting off to the ends of the earth with. Throughout the book, Dunlop has this wonderful way of describing the tastes and the essence of food, and ‘Shark’s Fin and Sichuan Pepper: A Sweet-Sour Memoir of Eating in China‘ is full of amazing, bizarre, and sometimes even shocking tales. I found myself reading through this book – giggling, getting hungry, and experiencing her remarkable journey as a vicarious travel partner. The Bottom Line: I highly recommend this book. And then, of course, once you read it, you too can join the ‘Fuchsia Dunlop Admiration Society’ (OK, so I made that up) and can follow her on twitter! Now if only we could get her to come on vacation and speak at Omnivore! We’ll have a party! 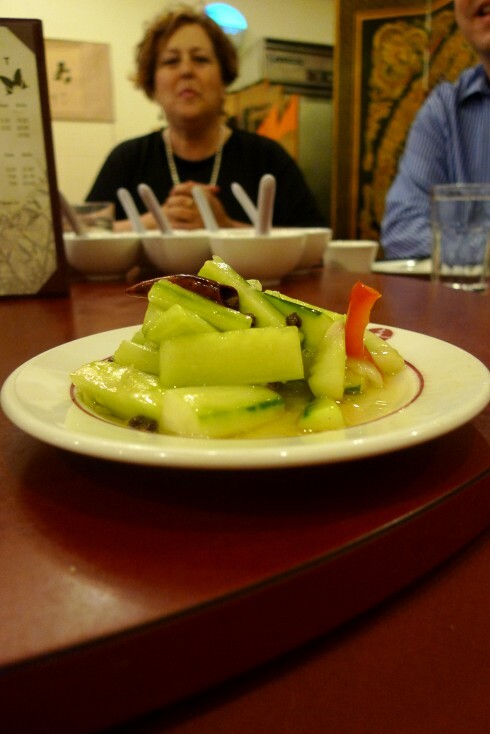 And now, while we are on the topic, here are a few photos from a dinner I had with fellow food bloggers quite some time ago at Sichuan restaurant Z+Y in San Francisco’s Chinatown. Totally Authentic? Not quite, but it was delicious nonetheless. I’ve had a soft spot for Sichuan since I was a child, mostly because one of the better Chinese restaurants in our slightly sleepy corner of New Hampshire was called Szechuan Taste. There was one in Portsmouth, and then they opened another one in Exeter conveniently located blocks away from my high school. 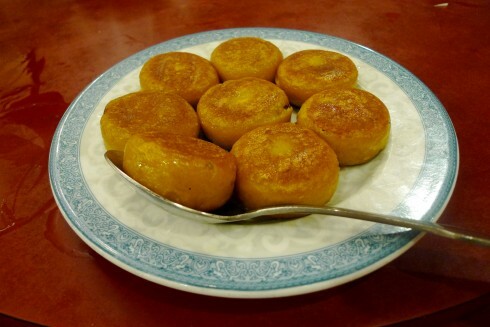 I can’t really vouch for the authenticity of the food, as they became very Americanized over the years, but I loved the place and have fond memories that guided my pursuit of knowledge into Chinese cooking, so I have to give them credit where credit is due. At Z+ Y, we ate (somewhat gluttonously, between eight of us): Scallion Pancakes, Spicy Numbing Beef Tendon, Yunnan Style Steamed Chicken Soup in Clay Pot, Peking Duck, Pea Sprouts with Garlic, Special Pork Belly (not on the menu), Chicken with Explosive Chili Peppers and Hot Braised Sea Bass, Cured Beef Wrapped In Scallion Pancake, and Red Bean Buns for dessert. There is something really reassuring about eating dinner with food bloggers. For one, you don’t have to feel any embarrassment about taking photos of the food, and really the phrase “WAIT – let me just snap a few photos please!” even remains unsaid. Although, to be fair, Devon is very good about waiting patiently for me to take my photos at dinner. Bloggers in attendance: @cookingwithamy @chefjen, @urbanstomach, @summertomato, @alphaprep (yep that’s me), @divinacucina, @heatherhal and @Jeters. Another thing about eating with food bloggers is that you can order half of the menu and not skip over the bits and pieces of the animal for fear that your dining partners will not be so keen on your choice. 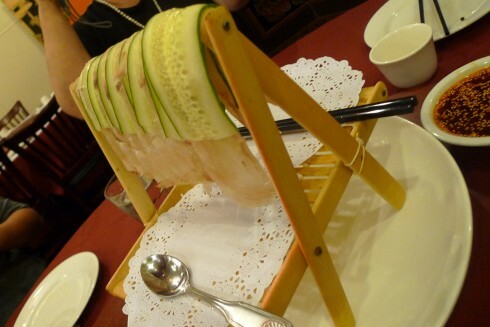 And so here, a dish that we all (or mostly all) enjoyed: Tendon. It’s not just for pho! I can’t get over the fact that it looks like I’m being served food on an easel. I really got a kick out of this dish. The beef tendon was shaved thinly, and served with a tingly numbing sauce. 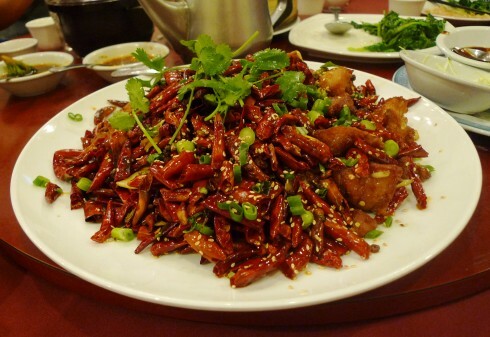 We food bloggers also really appreciate highly photogenic foods, such as this Chicken with Explosive Chili Peppers. Massive piles of fiery peppers in contrasting red and green! I’m fairly sure this had more peppers than would be needed or wanted in the home, but it made for an exciting presentation. And then there was the duck. Apologies to @jeters for the “in the moment eating shot”, but I had to put this in as it was the only shot of the duck I managed to take. I’ve been a devotee of duck since my childhood where my favorite memories of Chinatown were the ducks hanging in the windows. I’m sure my parents were slightly concerned about my excitement – I was at that point fully aware of the live happy farm duck being the same, in theory, as the dessicated hanging duck in the window – and I still would ask to eat it pleadingly. A great part about the food blogging community is that you can eat with people that you greatly respect and admire, and even if their work is heralded across the globe, perhaps in bookstores, or written about in famous magazines, even the best food writers will gather to share a meal – food is something we all have in common. The lovely and talented Divina Cucina in the background (for whom this dinner was in honor of), and quick pickled cucumbers in the foreground. Food bloggers also have gumption and forethought to order in advance, and throw their hands into the air and say feed me the best you can! The Japanese have a word Omakase, or Chef’s Tasting Menu, that is in the spirit that I like to eat – allowing the chef to choose the best, the freshest, the most interesting foods, and as a rule, I always defer to their suggestions for which I’m often highly rewarded. 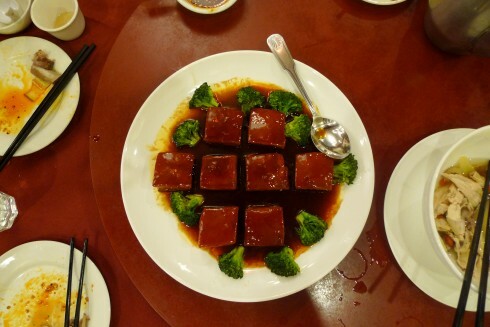 The pork belly – not on the menu, but at the recommendation of the chef was delightful – a current food trend, pork belly has been a delicacy for hundreds, if not thousands? of years, and prepared simply, this was one of the better experiences with pork belly I have had to date. And then there is that moment in many a meal, where sometimes, even seasoned food bloggers are slightly perplexed. 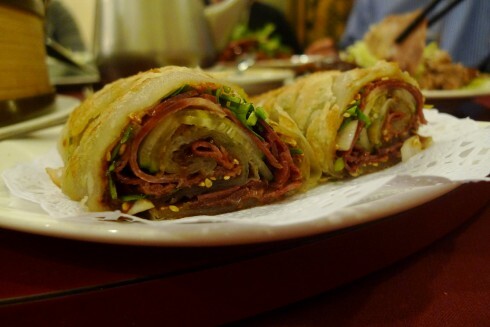 In this case, the moment was when we were served the cured meat wrapped in scallion pancake – Chinese-Jewish fusion food? I wasn’t able to grasp the influence, but I liked it! Finally, we ended with red bean buns, and slices of orange, which, although I do have some fabulous photos of friends making awkward orange smiles, I’ve held back at posting them, perhaps though, they’ll serve as future blackmail. For more perspective, check out Alex’s write-up (same dinner, lens across the table). 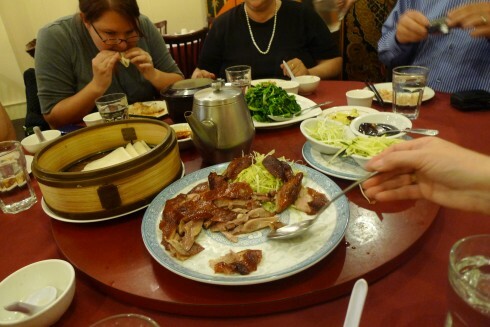 And for even more convincing, Marcia (The Tablehopper) also had a great writeup of her dinner a month ago. .-= Suzy (Foodie in Berlin)´s last blog ..Urban Honey – Berliner Honig =-.